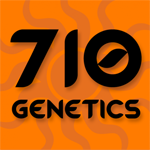 710 Genetics - AK 107. Free US delivery. AK-107 is an indica and sativa hybrid created by crossing the AK-47 with an Elite UK clone. A robust and highly resinous plant, the indica qualities ensure it is faster to grow, more solid in construction and brings an added level of consistency. In the smoke, she is almost pure sativa, ensuring those blissful feelings of relaxation and tranquillity. AK-107 produces hard buds with an exceptionally strong aroma paired with a delicious earthy, skunk flavour that fills your mind, body and soul. It dissolves pain, stress and depression and its offers a total sense of relief.